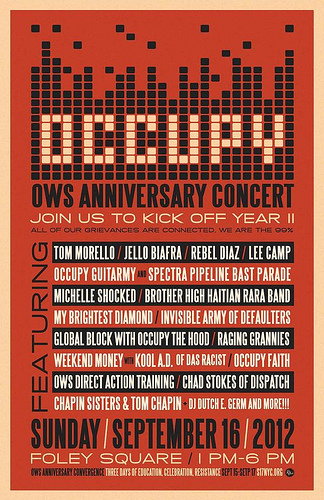 Hats off to West Coast artists Tom Morello, Jello Biafra and Michelle Shocked for joining Lee Ranaldo and Co.at New York’s Foley Square Park last Sunday for the kick off of the one year anniversary week of Occupy. Shocked performed “99 Ways to Loathe Your Lender,” sung to the tune of Paul Simon’s “50 Ways to Leave Your Lover.” Though Shocked discourages filming of her shows, I hope she won’t mind that I found a barely viewed clip of her performing it (she follows Biafra’s spoken word piece). The protest standard, “Which Side Are You On,” was performed as a singalong (it’s as close as any song the movement has to an official anthem). Happy Anniversary Occupy, and thank you to the Occupiers and musicians who represent the 99 percent.